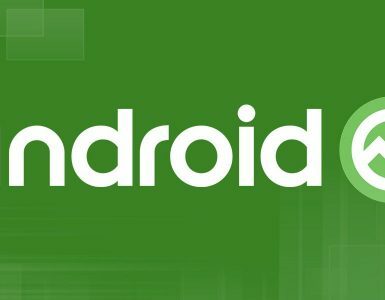 Google had already launched its new Android version better known as Android P back in March this year. However, Monday was yet another important day for the tech giant as it officially announced the date of unveiling Android P.
In addition, it also raised the curtains over the alphabet P and finally revealed its name as Android 9 Pie. It has already begun rolling out for the owners of Google Pixel smartphones. The release also follows a public data program This is a significant step from Google. The reason- this is the first time that the Company is allowing the beta version of the program to other devices and gadgets including its own. So, this is great news for people using various other devices such as Oppo, Vivo, OnePlus, Samsung, Sony, Nokia and Xiaomi etc. 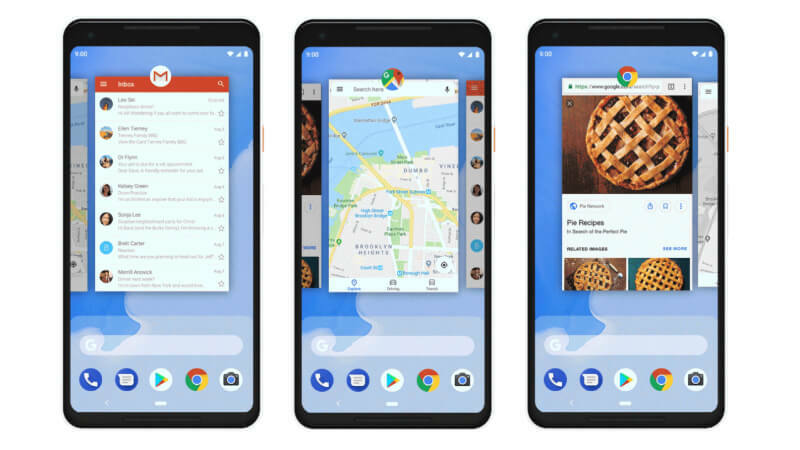 With the launch of Android 9 Pie, Google has exuberantly tried to bring some of the remarkable changes in the features, functionality and focused devotedly on improving the User Experience. Yes, one would come across a spectrum of new changes such as use of more vibrant and colorful interface, introduction of new movement and animation features including rounded corners and screen cutouts. And this is not the end. Google has also tried its level best to improve the battery life by introducing a new feature known as Adaptive Battery. . To tell you more, the Android 9 Pie is much more efficient and faster than the Android Oreo. So, now it’s time to find out the interesting and exciting features that Android 9 Pie has brought for the users. One of the significant changes that Google has made in the latest version is related to the gesture navigation. We all know that most Android devices have the three conventional buttons that of home, scrolling back and overview of recently visited apps. So what are the new changes in the gesture navigation? First, it gets the same place as the traditional buttons but the difference lies in the fact that the home screen button will now have a pill-shape and it also moves. You can tap it to go back to the home screen and also view the recently navigated apps by swiping and stopping . Apart from that, it also allows you to open the app drawer by swiping more than the half way. . You can also hold it down to activate the Google Assistant. If you swipe it towards the right, you would get to the last navigated app and drag and hold to cycle around the recently visited apps. Through you would come across the back button when required but there is no overview button now. The gesture navigation will not get activated by default but you have to go to the Settings and choose the option accordingly. Google has faced concerns related to battery performances in the past and so this time around it has brought an enhancing change by introducing the Adaptive Battery. The Alphabet’s AI-outfit DeepMind technology has enabled the Adaptive Battery to lean towards those specific apps, which are frequently used after learning the usage pattern of the user. In fact, users of the Android P beta version have found that their battery life has considerably improved by 20% and also enhances the life of the devices as well. The Artificial Intelligence (AI) will play an important role in controlling the brightness of the device and will adjust according to user’s preferences. 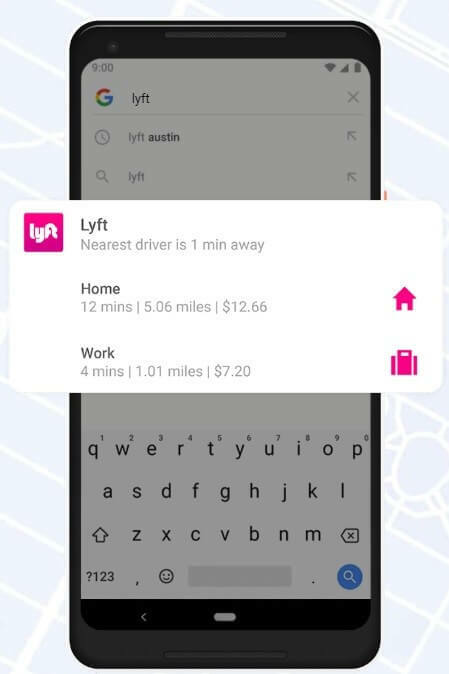 Google has introduced the App Dashboard so that the users can have a bird’s eye view of how they are using their smartphone. You will come to know the time period for which you are using the phone in a day and what apps are frequently visited. This will literally help in curbing the addiction towards phone and some apps. Besides, you would also know how many times you have unlocked your phone in a day. Apple has already introduced the Do not Disturb feature and now its Google’s turn to take the same action. So, you get rid with the unwanted notifications that keep popping up when you don’t need them. The new do not disturb feature takes out the visual indications and do not send alerts of app notifications, emails and other information. You have to turn the phone on its face to activate the do not feature. 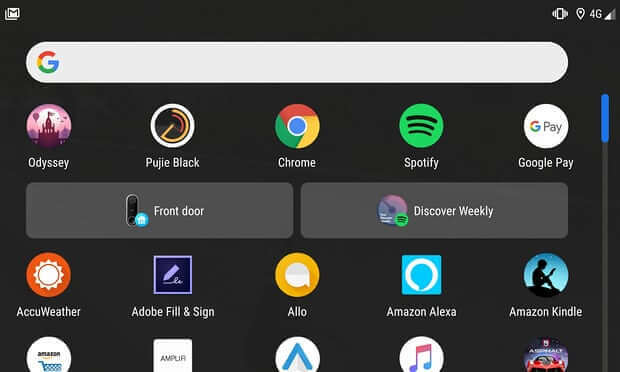 There have been discussions earlier that Google has been working on to introduce the dark theme in the new Android P version. All such speculations have come true as the new dark theme will allow the users to shift between the dark and the light theme by going into the settings. You can also allow the Android P; choose the appropriate theme for your wallpaper. Apart from the Dark theme, Google has refined the UI appearance through Material theme. 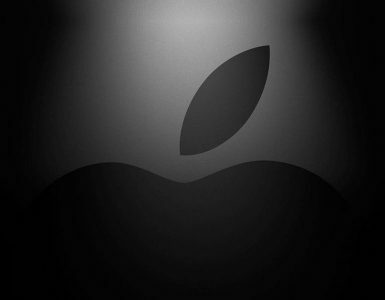 It has more revamped and subtle design with addition of the white space and rounded corners. The rotation change is quite useful. If your rotation lock is turned on to prevent the screen from rotating and you rotate your phone to view content in another orientation. , you would come across a small button in the navigation bar. You just need to tap the button to rotate the screen from portrait view to landscape and vice-versa. It would be helpful when you want the screen to rotate. 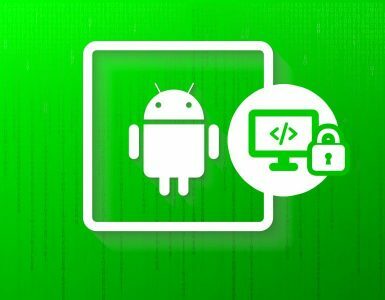 Google has also tried to improve the Android background so that it can provide a more sound and strong security and privacy to the users. Now if we take about the changes then the apps asking for location, microphone and camera permission will not be able to access any information when the app is in background. The apps spying on your device activities will no longer be able to keep their evil eye without the user’s consent. We recently saw these changes during the launch of iOS 12. In fact, these important changes will also better the performance of the battery. The Google has initiated another vital feature known as the App Timer allowing you to restrict your time limit spent on app navigation. You can go through this feature through the App Dashboard. This will extremely helpful and act as a parental control where the parents can set the time limit for which their children visit the apps. Once the time slot ends, the app icon turns grey and you cannot open the app. Another feature where the Artificial Intelligence has been implemented is App Actions. This will let you predict the app you want to visit a specific hour and also offer functionality and actions from within the app. For example, you book a cab at a particular time from a taxi app. Now as you open the app drawer at that time, you will get suggestions for one-tap access. The clock or time that used to appear on the right side of the screen has now been shifted to the left in the new Android 9 Pie. This may not be a big change but is important from the point of view for introducing the screen cutouts called notches. This is found in devices like OnePlus 6 and Huawei P20 Pro etc. Google has also informed that only two notches will be used on the one screen. This will allow Google to run the new version of Android. Another smart move by Google to curtail the phone addiction is the initiation of the Digital Wellbeing, which is Google’s anti-smartphone addiction tool. However, the beta version is under the testing process. In fact, it has been clubbed with Do not Disturb and App Timer to prevent users from using too much of their devices. Slices are a part of the App Actions that would be introduced later according to the Google. This is a wonderful feature that lets you get a quick access to shortcuts within the Google search. For example, if you are searching UberEATS, you would get a shortcut to order your meal online. This saves a lot of time and can be used conveniently. As of now this feature is only available in Pixel devices and for others, they would have to wait for some time. The Smart reply feature is already present in some of the apps such as Gmail, Inbox and Allo. But now this facility will be extended to other apps as well and can be accessed directly from the notifications for one-tap replies. Apple had introduced the magnifying glass for choosing the text and Google too is following the same trend. If you have to select a text, you just need a small tap on it. However, upon dragging one of the text selections, you would come across a magnified box instantly above the finger to make the selection simpler. Many smartphone devices have a feature that fades the blue light during the night as one prepares to go to bed. However, Google has taken one step ahead and bought a feature Wind Down that begins to remove the blue light as soon as the bedtime approaches and the screen is put to a grayscale. This will prevent people from using their smartphone before going to bed . The Android 9 Pie also brings forward new 157 emojis that include a llama, a superhero, and a gender-neutral family. Lastly, Google also announced the ML Kit for helping out the developers in taking benefit of the company’s machine learning technology on a device. 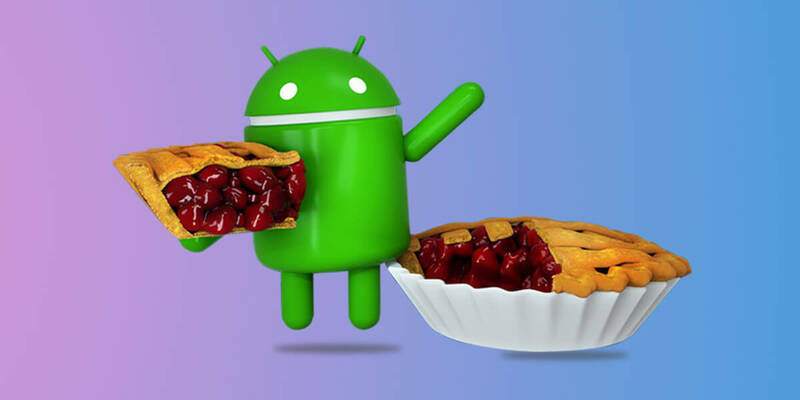 At present, the Android 9 Pie is available for the Google Pixel owners and Essential Phone through the over-air-update. Please got to the Settings System > Advanced > System update and then click check for update button. You can also wait for the notification to arrive. As for the others, they will have to wait for some more time. You need to check whether your smartphone will support the new version or not and wait for the update. Well, the Android 9 Pie is absolutely available for free update. You won’t have to pay a single penny for it. Now that the Android 9 Pie, the latest and new version of Google is on the carpet, you just have to update it and enjoy its enhanced features and benefits. The Google has introduced this version just to provide better and enhanced experience to the users For those who have to wait for the update, just keep patience as something very interesting and exciting is approaching your way!